For those who enjoyed Reanna Reloaded, Satan’s Sand and Truloix, comes an intense thriller. Four Critical Days: Triumph or Tragedy CIA analyst Jay Wilson joins a multi-national group in Kiev, Ukraine to investigate groups undermining the country’s freedom by assassinating the presidential candidate supporting freedom in four days. But one by one, group members keep getting murdered while others scatter. 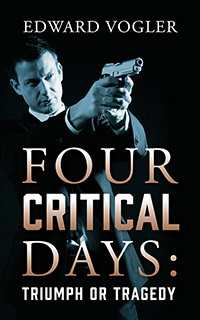 Can Wilson locate the assassination group thwarting their plans in four days? Can he locate the killer, or will he be next target? A proud Marine Corps veteran, Commercial Pilot and Flight Instructor, writes on his favorite pristine beach in Florida, enjoying the golden sun while the gentle breeze whispers through the palm fronds overhead where hundreds of short stories have been given life. They have provided joy to many readers throughout Tampa Bay. He recently completed his sixth novel.